As a roaring lion is used as a biblical reference to one's enemy; and as such is a descriptive narrative used many times in God's Word. 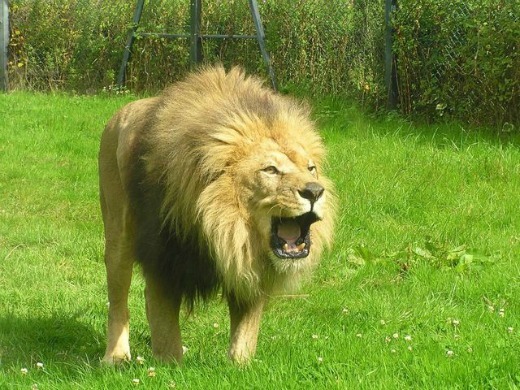 The lion is a large carnivorous animal found in Southern Asia and in most parts of Africa. In the Book of Judges we are told that Samson, with his father and mother, were in a vineyard; and that as he turned away from his parents, perhaps to eat some grapes, a young lion roared and came against him. And the Spirit of the Lord came mightily upon Samson, and he laid hold on the Lion with nothing in his hand, only the increase of bodily strength through the Spirit of God, and he killed the lion (Judges 14:5-6). God's Spirit would come on Samson many times to give him victory over Israel's enemy the Philistines. In the Book of Hosea; as a roaring lion is in reference to the coming Messiah (or Deliverer): He shall roar like a lion: when he shall roar, then the children shall tremble (Hosea 11:10). The Messiah was compared to a lion for his strength and courage, and for the fierceness of his wrath against his enemies; and his voice, and words, like the roaring of a lion, exceeding loud, and reaching far, even to the uttermost parts of the earth. Jesus, the foretold Messiah (John 1:41-42), revealed that the gospel of the kingdom shall be preached in all the world for a witnesses unto all nations (Matthew 24:14). The Book of Job refers to the teeth of the young lions being broken (Job 4:10). The teeth of lions are very strong in both jaws; they have fourteen teeth, four cutters, four canine type teeth, and six grinders. All intended to do their destructive work; except when broken, then the lion perishes for lack of prey (Job 4:11). Scripture reveals that the apostle Paul was delivered out of the mouth of the Lion. The reference is to his being delivered from death many times, which like a lion, would seek to devour him. The apostle Paul stated: The Lord stood with me and strengthened me; that by me the preaching might be fully known: and I was delivered out of the mouth of the lion (2 Timothy 4:17). Scripture tells the believer to be sober, be vigilant, because your adversary the devil; as a roaring lion, walks about seeking whom he may devour (1 Peter 5:8). This is on account of his strength, and also rage, and malice, which he, as a roaring lion, breathes out against the saints. Whom resist steadfast in the faith, the God of all grace, who has called us unto his eternal glory by Christ Jesus, after that you have suffered awhile, make you perfect, stablish, strengthen, and settle you (1 Peter 5:9-10). We are living in a time that evilness is attempting to suffocate the godliness of man. As a roaring lion it breathes on those who attempt to live a godly life in Christ Jesus. However, Scripture reveals that believers in Christ no longer live in the flesh to the lusts of men, but to the will of God (1 Peter 4:2). That they (or the ungodly) think it strange that you run not with them in the same excess of riot, speaking evil of you (1 Peter 4:4). For we (the believers in Christ) are not to yield our members as instruments of unrighteousness unto sin but as instruments of righteousness unto God (Romans 6:13). And to be not conformed to this world; but be transformed by the renewing of one's mind; to prove what is that good, and acceptable, and perfect will of God (Romans 12:2). The believer is to walk in the newness of life in Christ Jesus (Romans 6:4).